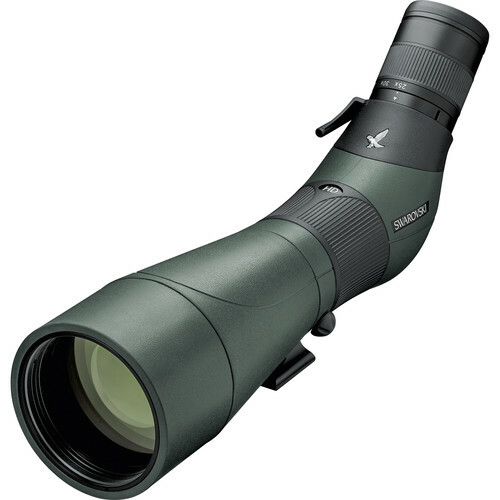 Updated with an easy-to-use Arca-Swiss-compatible mounting shoe, the angled-viewing Swarovski Optik ATS-80 HD Spotting Scope provides discerning users with the power and performance they've come to expect from the brand. This scope utilizes extra-low dispersion (ED) fluoride HD glass, which produces bright and clear views with accurate color representation. Color, clarity, resolution, and contrast are further improved through the use of the proprietary SWAROTOP, SWARODUR, and SWAROCLEAN optical coatings, which maximize light transmission while adding scratch resistance to the lenses and allowing dirt, dust, and oils to be easily cleaned off for smudge-free lenses. The large objective makes this scope ideal for making detailed observations of subjects at extreme long range, especially when coupled with the optional 20-60x zoom eyepiece. Front threads on the objective lens housing accept filters such as neutral density (ND) or polarizers to be installed to enhance views—this is especially useful when digiscoping with the ATS. This updated version of the ATS-80 comes with a variety of mounting options to make it compatible with a wide range of tripods and other support systems. The mounting shoe is now Arca-Swiss compatible, so it will fit directly into Arca-Swiss heads without the need for quick release plates. If the user's head is not an Arca-Swiss type, the shoe has a dual 1/4"-20 and 3/8"-16 threaded socket that will make it fit onto most standard photo/video/field tripods, heads, and quick release plates. The scope body is made of a lightweight and durable aluminum alloy that is nitrogen filled and O-ring sealed to be waterproof and resistant to internal fogging. A large slip-resistant collar enables precise focusing even in cold and wet weather or while wearing gloves. Box Dimensions (LxWxH) 16.5 x 6.5 x 5.0"